Madhu Maheshwari has been teaching Hindi passionately for last 27 years to children, university students diplomats, ambassadors, and language supervisors. She has taught Hindi at Georgetown University, Johns Hopkins, SAIS, and Diplomatic Language School, Washington Language School and numerous language schools of metropolitan area. She was a Pedagogical expert for the Developing Lang Net Interactive. Her creative way of teaching Hindi has earned her highest rating evaluations from the students at the University level. At school level, her students have been appearing in the Fairfax County Exams since last seventeen years and have been obtaining high school credits. Many of her students have passed the Penn State Proficiency exam and Pravshika exam given by Indian Embassy. She is master at creating any kind of curriculum at any level in the most comprehensive way and the context of these curriculum spell achievement and success for her students at anywhere at any level. Her vast linguistic training and voracious reading of all kind of Hindi literary works are reflected in her curriculum in the most vivid, vivacious and the vibrant way. At cultural level, she involves all her students whoever wants to participate in the Hindi plays which are written and directed by her and are based on the cultural, historical and spiritual themes of India so students while learning Hindi get the glimpse of ancient, medieval and modern History of India and get connected from their heritage. She has published a children’s Hindi play book called “Bharat Bhumi”. Her Hindi class rooms are filled with fun activities where students learn Hindi through games, real objects, skits, grammar exercises and acting. The learning tempo is set at the median learning curve of the class. Fun is the central theme of her classes but in a way that it encompasses all the learning modules of language like speaking, reading, writing, reciting and listening. Plays performed by her students leave audience spellbound by their enormous charm and vibrant energy and has been shown few times on Local TV programs. At one point her plays has helped the Rajdhani Mandir in its fund-raising efforts to build a temple. She has acquired certificates by Summer Institute program of NOVASTARTALK for Instructional technology. She has attended the workshops by ACTFL in Arlington and at Johns Hopkins university and have created the course work according to college levels and many of her private students from GW and American university have passed their required college proficiency exams. She also created the first Hindi proficiency exam for master’s students of SAIS. 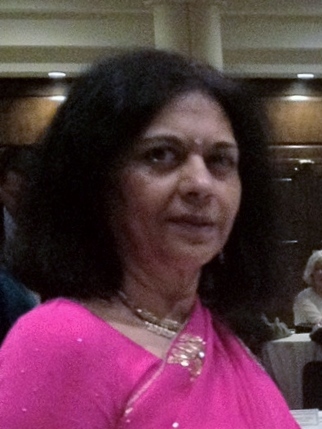 Last year, she taught Hindi to a group of professors who were traveling to India at Montgomery college. She won numerous awards and honors for her Hindi writing, teaching and her literary works. She has been featured in the Dordarsahn movie for her promotional work of Hindi in USA. In 2005, she was selected by the State Department to recite her poems at their first interactive tale -conference which was televised in India and at the American Embassy in New Delhi. She has co-edited a book called “Dishanter” which was used as a course book in Yale University. She is a Hindi activist and was a chair person of International Hindi Association for seven years and successfully organized many Kavi Sammelens and many literary activities in the Washington metropolitan area.